At 5.35am, the Wehrmacht begins ‘Operation Yellow’, the invasion of Holland, Belgium and Luxembourg, employing Army Group A (von Rundstedt) and B (von Bock), with Army Group C (von Leeb) in reserve. The attacking forces comprise 10 Armored, 5 Motorized, and 75 infantry divisions. The 19th Panzer Korps (Guderian), 20th Panzer Korps (Hoth) and the 41st Panzer Korps (Reinhardt) field between them 2,445 tanks, most of which are of the light Marks I, II, 35(t) and 38(t) type, against 3,373 French and British tanks. In his Order of the Day, Hitler declares, “Soldiers of the Western Front! The battle which is beginning today will decide the fate of the German nation for the next thousand years. Go forward now and do your duty!” Airborne troops seize airfields and strategic bridges near Amsterdam and Rotterdam in Holland. The Luftwaffe, using hundreds of level and dive bombers, attacks Allied airfields, troop assembly areas and rear communications. Prime Minister Neville Chamberlain resigns and is replaced by the First Lord of the Admiralty, Winston Churchill, who forms a coalition government from all three main parties. 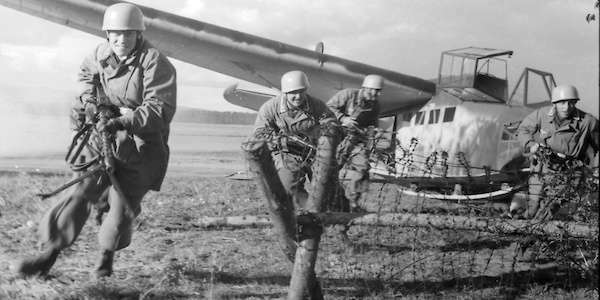 German Fallschirmjäger attack Fort Eben-Emael by glider in the first Airborne Operation in history. The Luftwaffe launches a massive attack against London, the heaviest so far received by the capital. One third of all streets within Greater London are rendered impassible and 155,000 family’s are left without gas, water and electricity. Westminster Abbey, House of Commons, Tower of London and the Royal Mint are all hit. A record 1,436 people are killed and 1,792 are seriously injured. Rudolf Hess, Hitler’s deputy and former World War 1 fighter pilot, flies from Augsburg to Scotland to persuade anti-Churchill politicians that England should stop the war with Germany, adopt a neutral attitude and allow Germany to eliminate the Bolshevik menace and gain Lebensraum in the East. He is taken to a secret location, interrogated and then held incommunicado at various places until the end of the war, later to be charged and condemned as a major war criminal at Nuremberg. Kesselring declares that Malta has been neutralized. However, that same day the Axis air forces found themselves outnumbered for the first time in the sky over Malta, losing 12 aircraft in return for 3 RAF Spitfires. This marked a definite turning point in the fortunes of Malta with Axis air activity slackening noticeably as aircraft were drawn off to Russia. Winston Churchill warns that Britain will use poison gas on Germany if the Germans do so on the Soviet Union. The battle for Sevastopol rumbles on, with the Russian Coastal Army fielding 106,000 men, 600 guns, 100 mortars, 38 tanks, and 55 planes. The Germans hurl 204,000 men, 670 guns, 450 mortars, 720 tanks, and 600 aircraft at Sevastopol. The Germans also move in 19 motor torpedo boats, 30 patrol boats, eight ASW boats, and a unit of 150 bombers trained in anti-shipping operations. German artillery ranges from 76mm field guns to mammoth 800-mm railway-mounted super-heavy siege mortars. The Germans open up a new death camp just outside Minsk, near the village of Maly Trostenets. Russian POW’s and Jews have been forced to build the barracks for 600 slave labourers and their German and Ukrainian guards. Tens of thousands of Austrian, German, and Czech Jews are shipped there and driven towards the village in mobile gas chambers. When the vans reach the camp, all inside them are dead. At the camp, the slave labourers bury the bodies in deep pits. Maly Trostenets remains a tight German secret. General William Sharp, commanding the Central Philippines orders the surrender of the remaining US and Filipino forces to the Japanese, thus ending resistance throughout the whole of the Philippines. The British First Army reaches Hammamet. U.S. troops invade Attu in the Aleutian Islands. The Free French claim that the resistance now numbers 100,000 and plead for more military aid. The first U-boat to surrenders, U-249 puts in at Portland. Russians troops are now in control of Prague after five days of fierce street fighting between German and Czech Partisans comes to an end, during which 5,000 civilians have been killed. The Fourteenth Army moves South in central Burma and links up with troops from Arakan in the west, trapping all Japanese to the west of the river Irrawaddy.